At the moment I have an Epson SX215 which I’ve owned since 2009. I bought it on a whim in Tesco one day after my Epson Stylus Color 880 stopped working. Under normal circumstances I’d spend weeks or months researching the ideal printer but since I needed access to a printer that day I bought the first thing available. 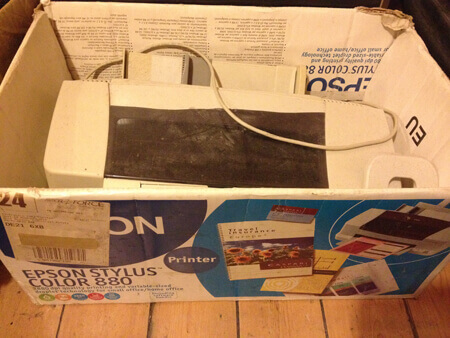 I miss my late Epson Stylus Color 880 printer. There are fond memories of printing hundreds of flyers at 3am one weekend in 2008… without any printer ink issues. The SX 215 has been okay overall, but honestly, if you’re considering buying a printer, avoid Epson altogether. I do not recommend Epson even though I’m writing about them and own one of their printers. Epson inks are expensive. I feel it’s my right as a consumer to use off brand inks. 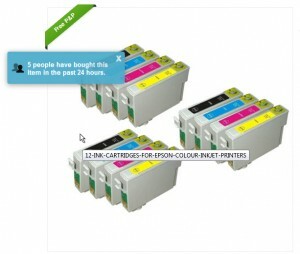 Here’s the problem: it’s always been hard to get the non branded compatible ink cartridges to work with their printers. 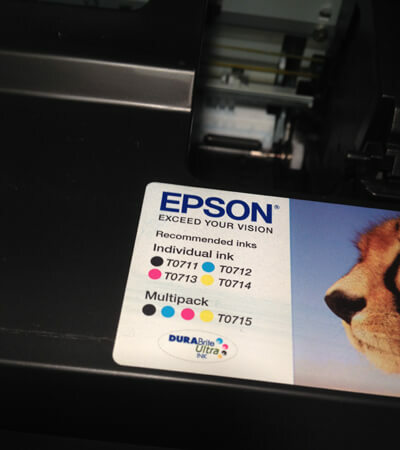 Epson appear to put a lot of effort into causing issues for consumers who use these cheaper inks. It seems like they try to bully companies who produce compatible inks. Epson seem to be trying to operate a racket, where they sell the printer cheap (this one was about £70) but are free to raise the price of their “official” branded ink cartridges while claiming that pirate knock-off brands are somehow damaging. I understand the business model. It is a loss leader where you sell something cheap up front (in this case, a printer) and milk the cow now and forever selling the vitally important (and expensive) inks. But then the consumers find a way to bend the rules and the manufacturers realise they’re screwed and begin trying to control the consumers. It kills brand loyalty and creates a them and us feeling. In the last few years, I’ve had situations where the SX215 more or less ground to a halt, screaming at me about having the wrong inks installed. It would often do this when I had just fitted a new cartridge. Like a petulant child, it wouldn’t do what I wanted it to do until I had appeased it in some way. Usually I’d have restart or reinstall something. There was a particular day when I had a lot of printing to do and the damn thing wouldn’t work. Basically, I felt it had stuck its middle finger up at me. My memories of what happened exactly are vague but it may have involved reinstalling the drivers. It was a horrible day and extremely stressful because I had website project deadlines for which the printer was needed. Hours were spent reading tutorials, downloading troubleshooting guides and searching forums. The guy at my local printing shop, Alan, had lots of stories to tell me about Epson and how they like to “retain” customers. We agreed the ring-fencing strategy is pretty damn cheeky and doesn’t go down well AT ALL with tech-savvy customers in the printer consumables market. The following video helped me get back up and running when the printer suddenly stopped printing. It said the inks weren’t recognised but the ink levels were shown as looking reasonably healthy. Thankfully, there is a dirt cheap supplier of Epson compatible inks on eBay, and if you buy your cartridges in bulk they’ll last a long time. 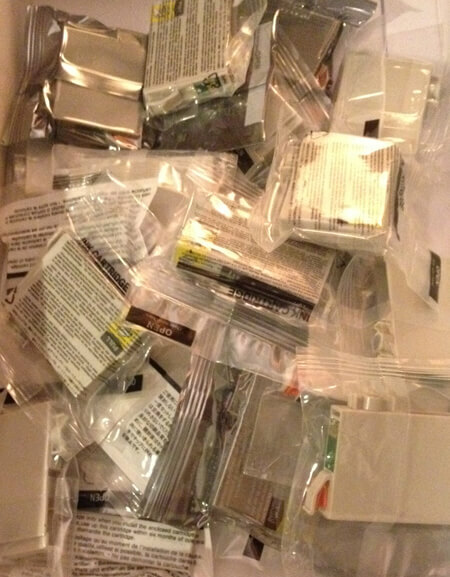 I order 24 colour and black off brand printer ink cartridges every few years. The only time I’ve bought a full priced Epson cartridge is in situations where it was desperately needed and I didn’t have time to wait for off brand inks to arrive in the mail. One time, an important letter needed printing, and without any of the off brand cartridges handy, I hurried to the supermarket and spent £11 on three cartridges. You can check out eBay or Amazon and see what unbranded cartridges are available for whatever printer you have. 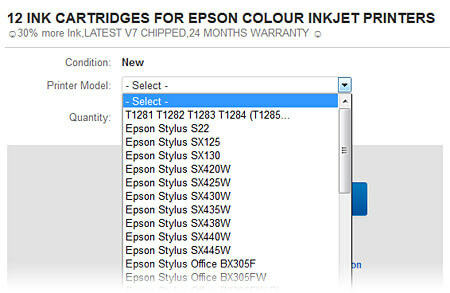 Make sure you get the model number of your printer so you can search for the right kinds of inks. Sometimes, the seller listings might not actually list your printer model in the product description of unbranded inks. This is unfortunate, because more often than not, the inks ARE compatible. It is just that the sellers do not always mention every single model number. 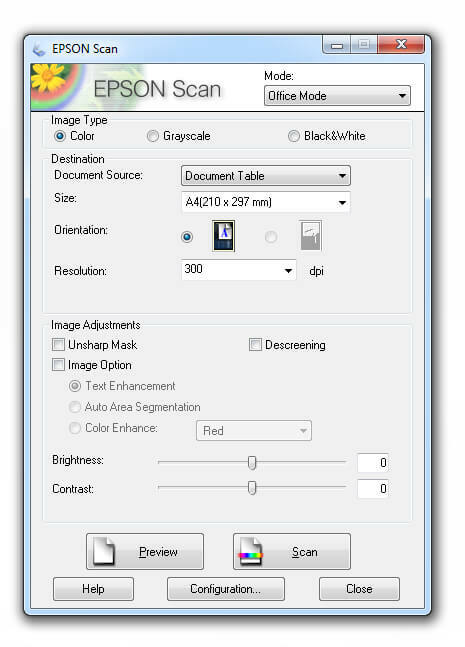 In the example below, the Epson SX series is mentioned, but my specific model (the SX 215) is not included. It doesn’t even mention the SX 200 series. Strange. Sometimes it’s worth contacting the seller before you make a purchase to check if the cartridge is compatible with your particular model. They’ll usually respond and give you an answer. If you run into trouble with poor quality print outs, you may have dirty printer heads. You can run the nozzle cleaning routine through your printer software or you can do it manually as demonstrated here in this video someone else uploaded. I tried this and still had trouble. After a print test, I could see my Cyan ink cartridge was not printing a smooth line. 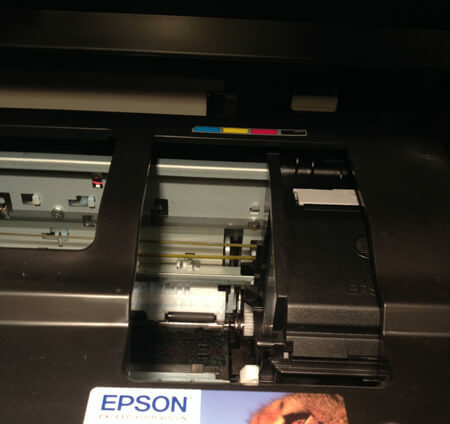 A quick search online presented this article about unblocking Epson printers and part of the advice I took away was to print a page using Best Photo settings because this uses all the nozzles and expels any trapped air in the cartridges. To my relief, this worked and I got a near perfect print out. It’s been a while since I’ve had any major issues, and hopefully, things will stay that way (touch wood). If you buy 24 ink cartridges, of both black and colour, they can be made to last a long time even if you do a lot of printing as I do. The cartridges are easy to change if you follow the on-screen prompts once a cartridge has expired. If you have important letters to print, you can feed better quality paper into the tray and set the print quality to a much higher setting. The SX215 can print composite black, which means if the black toner (0711) runs out, the printer will automatically use the other colours to create a black tone in the absence of the proper ink. This is not only a printer but a scanner and photocopier. The scanning capabilities are very important to me, and that’s something I’ve gotten the most value from. A scanner is great for digitising documents such as receipts. I use Photoshop to scan in documents. It’s important to keep those digital copies of expenses and archive them, because you never know when you might need to show a proof of purchase. At present, I’m a Windows 7 user, but when I purchased this particular printer, I was on Windows XP. This meant manually installing the drivers and keeping them up to date. But as a Windows 7 user there have been few problems and all I needed to do was install the Epson program from the installation CD. 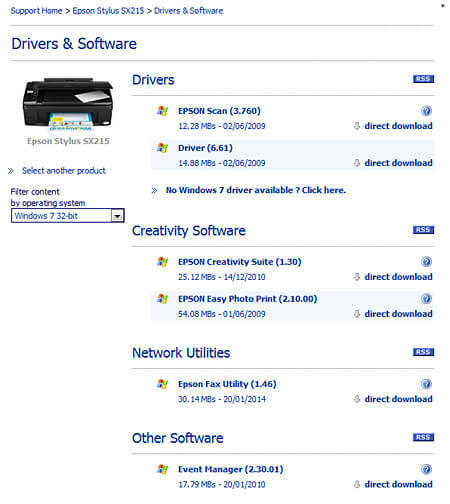 If you want to download particular drivers you can do that on the Epson website. What Printer Should You Get? If you’re looking to purchase a new printer, you could have a look on Amazon or eBay and compare prices. 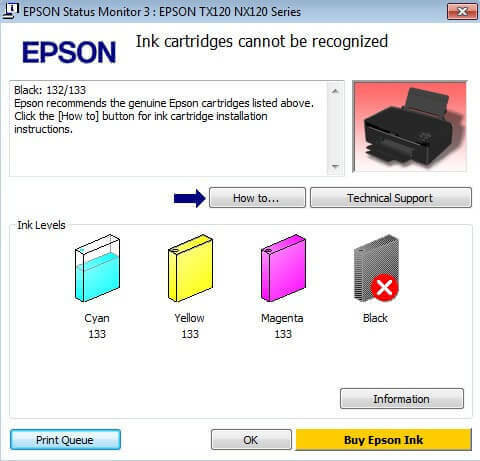 Just avoid Epson. Seriously, stay away from them. I speak from experience. If you already have one of their printers… well, it is a case of polishing a turd isn’t it? There’s lots of good brands out there, and my advice is to do some research and see which printers jive well with unbranded inks. 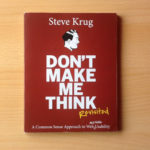 Find out which printers are not sold by brands trying to shaft their customers. I shared this printer with others in the house and thats OK. But I cannot so far operate the scanner from another pc networked to the pc operating the printer. The printer is itself not networked but can be shared. Any ideas? When you say it is not networked but can be shared, are you saying it is on a Windows HomeGroup? Good article, and completely agree regarding Epson! However, like you i have an SX215 that has been performing ok – to date. Following a paper jam, something obviously dislodged – now the printer is showing an error 101. I have found an online tutorial that looks like it might fix the problem, however I need to move the ink carriage to get at it. The carriage lock is on, and turning on the printer (usually the way to release it) simply displays the error message with no movement. Any ideas how to release it? any thoughts much appreciated – I can’t find a printer repairer locally, so it’s pretty much going in the bin unless i can work this out! I don’t have an answer for you, I’m afraid. I take it you’ve searched YouTube? Thanks for the reply. Yes I had searched everywhere, but the only solution ever given is ‘release the print carriage’ (not very helpful! or turn it on, and unplug as soon as the carriage moved (again, not helpful if the carriage won’t move!). However, as is often the case, the solution has turned out to be simple (after hours of searching!). For anyone else with this issue, there is a little white ‘catch’to the left of the carriage – with the printer turned off/unplugged, move this catch forwards and the carriage releases!